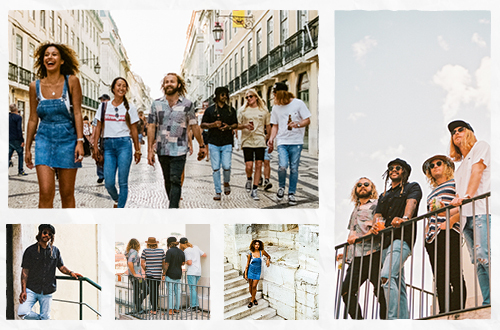 Portugal promised to be the land of amazing beaches, delicious food, relaxo culture and monster waves and it did not disappoint. Check out our best eats and top touro tips. 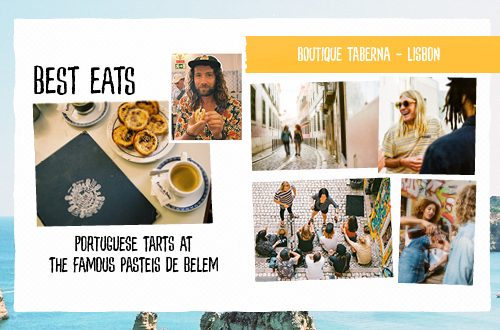 These guys are the pioneer of the Portuguese tart that kicked off a countrywide obsession back in 1837. This isn’t just a bakery, it’s an institution, producing more than 23,000 of these crunchy custard filled tarts a day, it’s an absolute must! We wrapped up our shoot with a sushi feast. Super fresh, all you can eat and with some interesting combos thrown in (jam and cheese sushi anyone?) Just make sure you take cash. If espressos aren’t your thing & you just can’t survive without your milky latte a day, head here for the best coffee & selection of milks around town. The freshest meal we had the whole trip, highly recommend. Will keep any vegans in the group happy! This rad vintage Boogie Bar is surrounded by some of the most famous graffiti walls in Lisbon & boasts live music daily. Sit back on the staircase & soak it all up with a jug of sangria with a kick! The boys were chasing a traditional feed, and family owned restaurant Piri-Piri had it all! We ate our way through the menu, the crowd fave was the local specialty Cataplana & the Piri Piri Chicken. Ginjinha, is a sweet cherry liqueur that originated in Lisbon, and a traditional Portuguese favourite. Known to be a wonder cure for all manner of illnesses, this drink has been passed down from generation to generation. 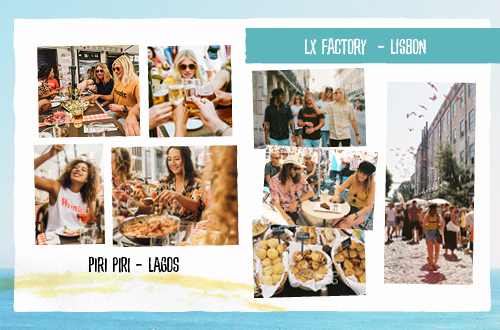 Head to Ginjinha do largo de Sao Domingo’s, and meet some locals. Sure to be the cherry on top of your day of sightseeing. Iconic, tiny & colourful trams that circle the city all day long. It’s an easy way to see the sights without having to climb all the hills by foot! An old industrial site transformed into a hub of creative spaces & unique restaurants. Come here for the famous chcocolate cake from Landeau, visit the epic book store and peruse the flea market. A great place for a day trip, to wash off those hot tourist days. Be sure to check out, Nazare, home of the monster waves, and epic sunsets. The Bilingil Caves are a must, and get a towel down early at Praia do Camilo, for some cliff jumping. Book a few nights at the postcard perfect, retro Solar de Mos Hotel. Hit up Vagabundo travel to take you to the end of the world. 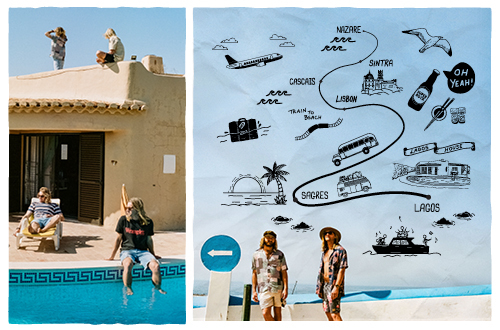 An Aussie tour guide with character will take you on a roadie from Lagos to Cape Sagres, aka the end of the world, to witness one of most trippy sunsets and explorin secluded beaches & caves along the way. At Wrangler our motto has been the same since the beginning. It’s all about the jeans. 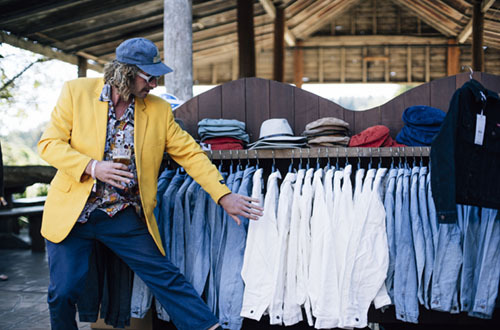 Designed locally in Australia for free-spirited individuals, who live by an underlying sense of adventure and freedom. 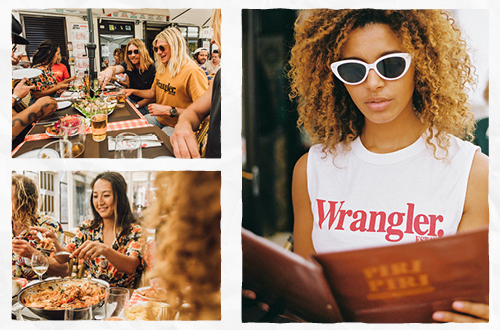 The Wrangler X fallen BROKEN street exchange party took place last Saturday from 11:11 as a pre Splendour shindig at one of the last great country pubs - the Billinudgel Hotel.